Alamosans are noticing the 20 new trees along Sixth Street. The trees are part of the “Beautify Sixth Street” project launched to enhance the appearance of the barren, one-way, downtown street constructed a few years ago by the Colorado Department of Transportation. 19 trees are planted on the south side between Ross and Edison Avenues along the new sidewalk. The three-inch caliper trees were funded with a non-matching $5,000 Xcel Grant. Shovels in hand, citizens Julie Scott, Marlene Thorness, Joel Fleming, Jan Oen, Don Thompson, and Ron and Marilyn Loser turned out to plant the trees. The Alamosa Department of Parks and Recreation crew ( Solomon Archuleta, Jeremy Arellano, Danny Ekspinoza, Danny Govea, and Dennis DeHerrera) and director Heinz Bergann arrived early to dig the holes and place the trees. Afterwards the trees were planted, each was circled with wire fencing for protection and staked against the southwest winds. 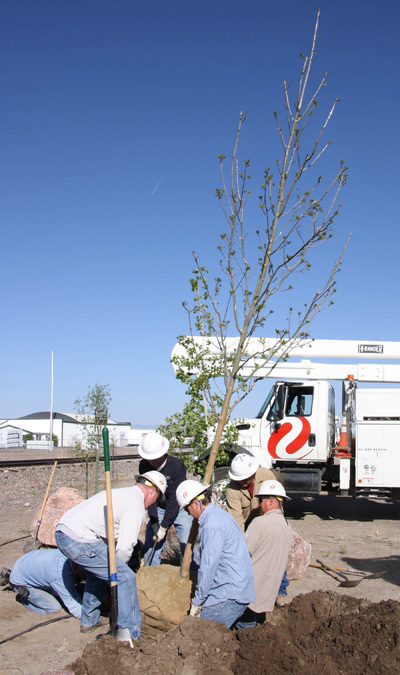 Local Xcel employees Foreman Perry Sowards, Lineman Travis Guymon, Lineman Brant Anderson, Foreman Brandon Bagwell, Lineman Keith King, and Manager John Valdez planted the 20th tree just west of the intersection of Highway 160 and Highway 285. A grove of aspens was planted last year in the area as the first phase of the project. The palette of species (Purple and Cimarron Ash, ‘Autumn Blaze’ Maple, ‘Canada Red’ Chokecherry, ‘New Horizon’ Elm, Hackberry, and ‘Shade Master’ Honey Locust) will provide a range of color, size, and texture for our enjoyment through the years. The International Society of Arboriculture and many landscapers suggest planting a variety of species so that all the trees don’t decline at the same time due to old age or disease. City Manager Nathan Cherpeski collaborated with the Rio Grande Scenic Railroad and the Colorado Department of Transportation to provide the necessary easements. This summer, a city-funded planting on the north side of Sixth Street just south of Sonic will complete the project. Xcel employess lower the Cimarron Ash into the wide planting hole. a Honey Locust along the Sixth Street sidewalk. 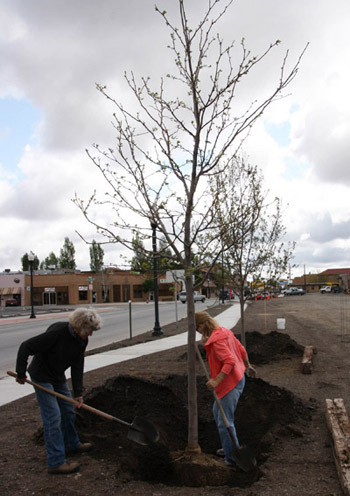 Alamosa is a Tree City USA for the 22nd year and received a Growth Award for the 11th time. 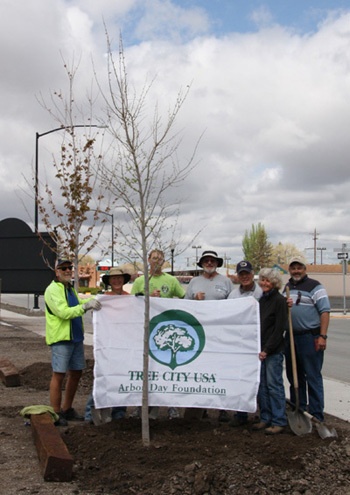 Did you know Alamosa is one of only 8 Colorado communities to receive the Sterling Tree City Growth award? The Sterling Award, a part of Tree City USA, is presented to communities that have received the Growth Award for 10 years. According to the Arbor Day website, the other 7 communities are Highlands Ranch, Durango, Loveland, Windsor, Grand Junction, Westminster, and Lamar.